Well, then it was just me, trying to find a job! Getting a lot of automatic answers telling me they deeply, seriously considered my application but I wasn’t good enough for them (sometimes I applied at 10 in the morning, got an automatic answer “thank you for your application” at 10:02am and the “we have carefully considered your application blabla” message at 10:05am, yes the same day. When it takes 3 hours to write to resume and cover letter for this position, it is terribly frustrating… Well, I might do a whole article about how to find a job here… but not sure! I got a job as a technical writer in a small insulation company (making glass wool, it is awesome to see the manufacturing process!) in a part time and temporary contract, in the beginning of October. A week later, I started having interviews and phone calls for a lot of other positions (in Health and Safety this time). Well, one worked out, after a couple of meetings, interviews and phone calls I got offered a position of Environmental, Health, Safety and Facilities Advisor, in an international healthcare company, starting on the 14th of December! 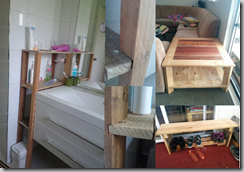 Before I found a job, and over the days off and week ends, we have been busy with a couple of things… building furniture and starting a veggie garden! We like to not spend too much money, and also doing things on our own. 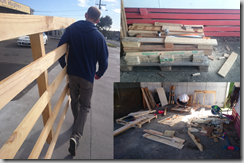 So, when we realised we could get pallets from the streets around the corner (we live close to an industrial area, pretty handy!) 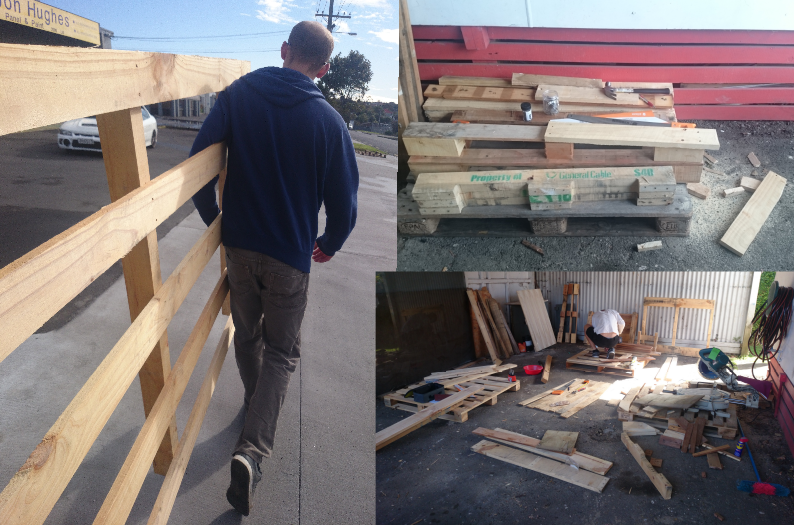 It took us a couple of drives around (and walks around for the biggest pallets that did not fit in the car) to transform our carport in a building site. We bought a couple of tools (hammer, handsaw, pliers, chisel, measuring tape, sanding machine…) and there we could start playing! 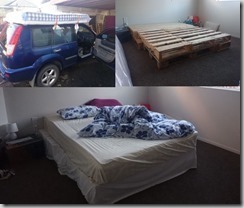 First step: getting pallets, driving and filling the car (or walking…) and transforming our car port!! 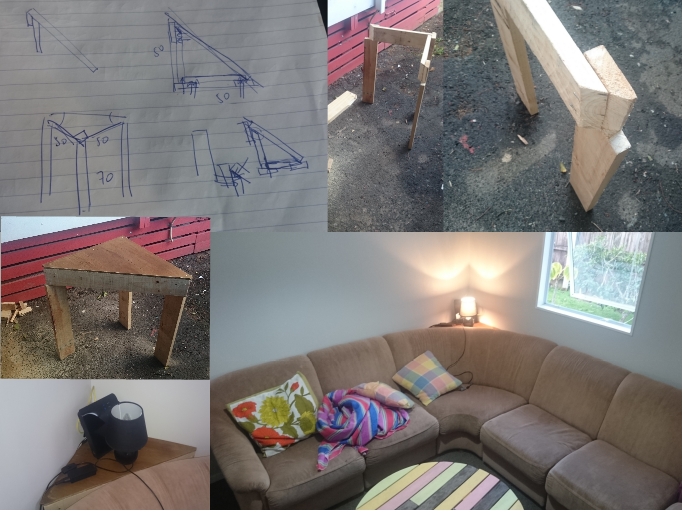 My first project: a small corner table to put a light and the modem in the living room! 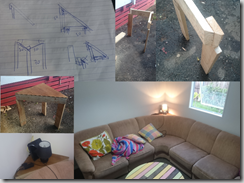 While I was trying m best with hand tools, Alex hired a drop saw to build a great coffee table and a shoe bench! 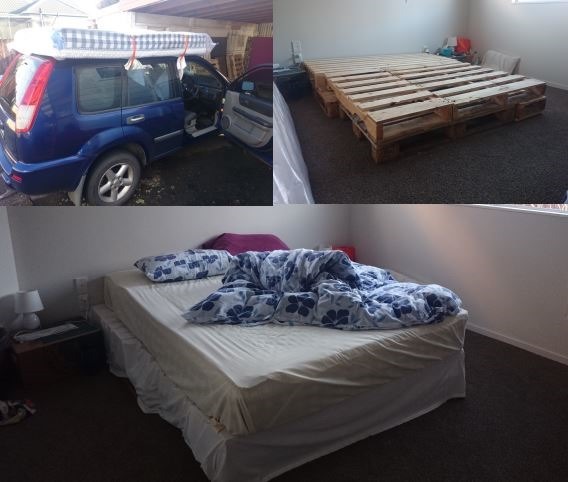 We upgraded our bed: we bought a great mattress and needed a bed frame… we have pallets, a hand saw and a sanding machine! We still have a lot of ideas of what to build… but now we need time! We are having a lot of fun doing these things. 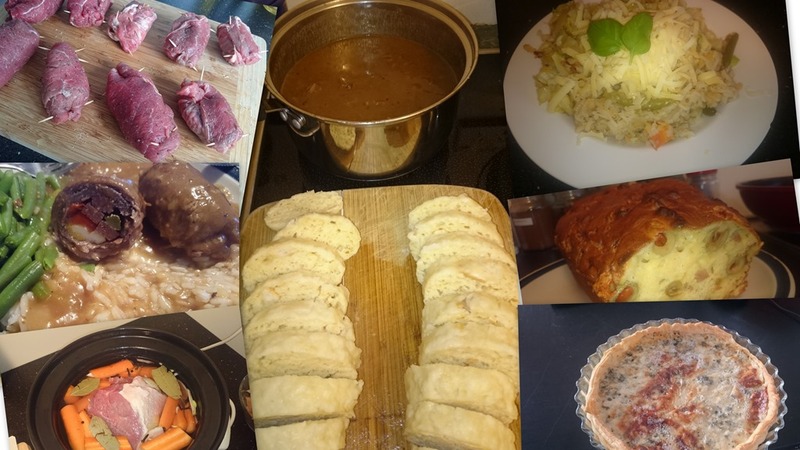 I have also been keeping myself busy with a lot of cooking experiences: (there is of course a lot more that I didn’t take pictures of! The first thing I wanted to do with our outdoor space was a worm compost! Then I wanted to grow vegetables. 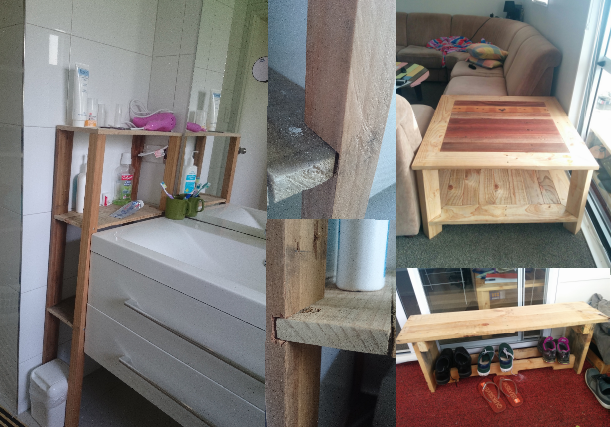 So I did all of it! To build my worm compost, I had to find worms… well, I got a spade, and started digging. Everytime, I could collect a couple of worms! great. I ended with a small amount, which I considered to be enough for a start. 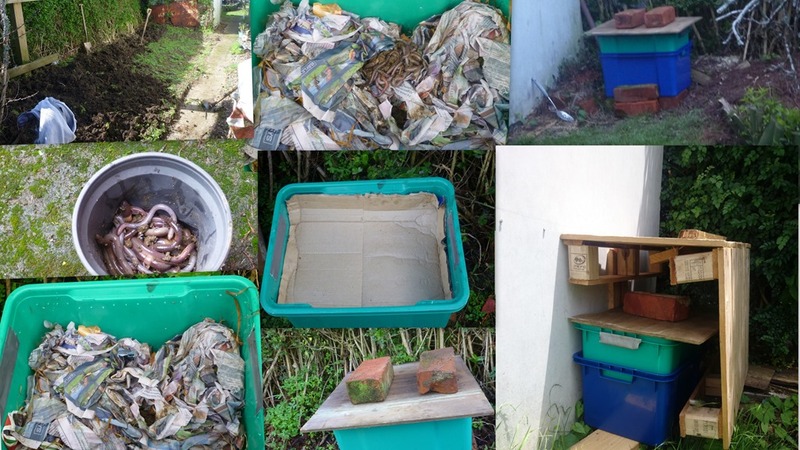 I created the bedding for the worms in a box, with wet news paper and dry leaves, with a bit of soil. Then I covered with card board and with a lid. I place the box on bricks that the worms wouldn’t come out to the ground through the draining holes (I assumed they would be scared of heights!). Well, 2 days later, I went to check on them, if they were “happy” and adapting to their new home. They did not adapt. They escaped. ALL of them. They didn’t like it. For my second try (yes I had to dig again the garden, to find the worms again…) I put another box underneath that they don’t escape (and to collect the tea if it ends up working…) and bought some sphagnum moss (that keeps humidity very well and keeps the soil moist) Perfect for a new bedding! So I put my worms again in the new bedding, and collected a couple of worms in the blue box in the following days. I explained to them that they would be really happy when they get my food scraps if they stay in the green box! So they did, at some point. they stopped trying to escape. And they get our food scraps (most of it) regularly. It does not smell, sometimes some scraps get rotten and I take them out. The worms are still adjusting to their new life style so I am not to hard on them and don’t get angry if they don’t like bananas or potatoes peels. But I hope this will change! Alex built a small hut for them, that they have no direct sunlight. They should be happy, I think they are breeding now and allow us to not have a stinky rubbish bin! 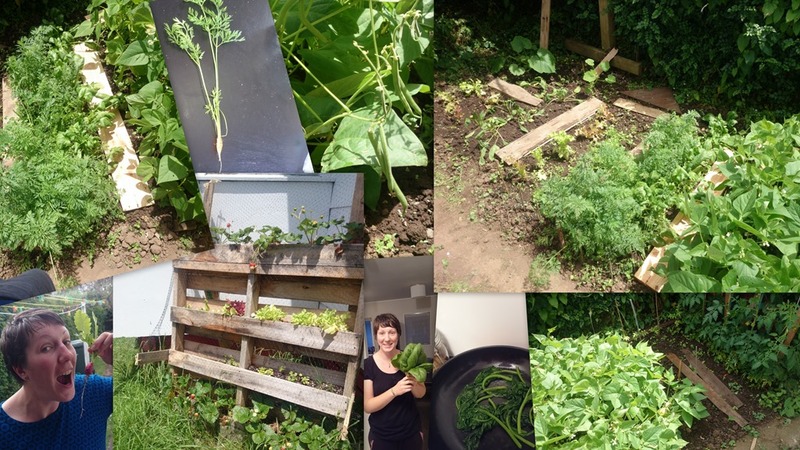 The vegetables: I wanted lettuces, green beans, tomatoes, zucchinis, radishes, spinach, capsicum… so I got it all! Started seedling early spring, in our entrance/veranda and was happy to see the first plants coming out of the pots a couple of weeks later! Meanwhile, when it wasn’t raining, I was busy turning all the soil upside down a couple of times and weed the whole area I wanted to plant the vegetables on. 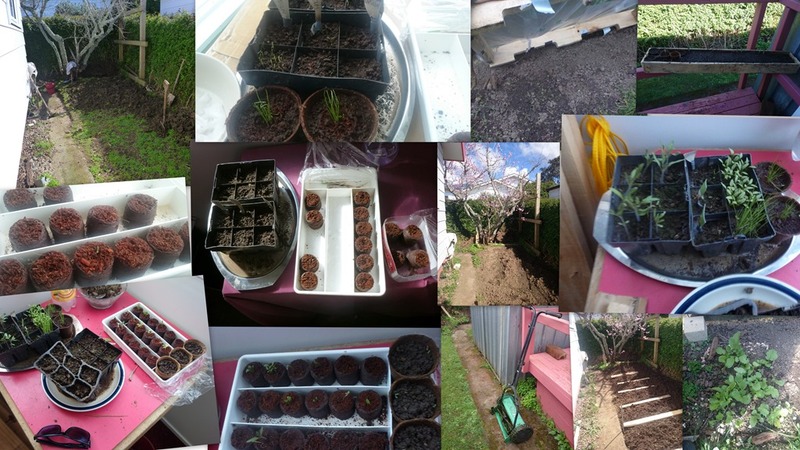 The seedlings and first leaves out of the soil! It’s growing! And it starts looking like the veggies! And there we are, getting the first vegetables beginning of December! It does take a lot of time to get around the garden, weeding is necessary every week everywhere! But it is worth it when I see the veggies growing. We had to organised the rain water supply: We had one big tank of rain water without a tap… pretty much useless! So we put one end of a hose at the bottom of the tank (attached to a brick) and a tap/handle at the other end. 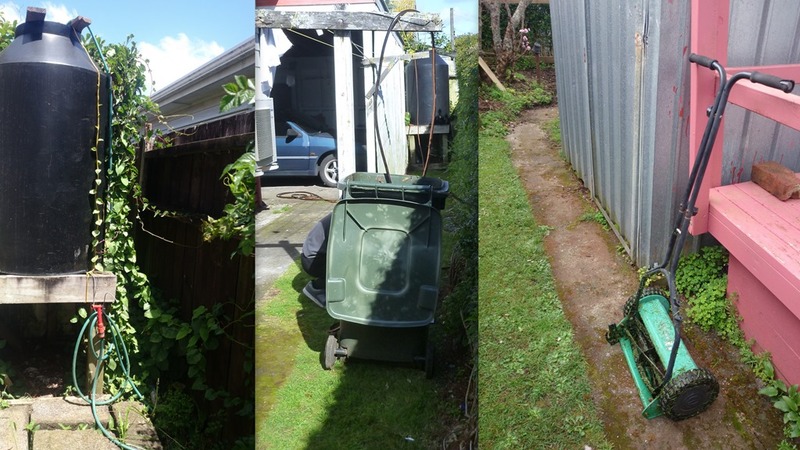 To make it easier to fill the water can and buckets for watering, and to have more water storage, we filled an unused rubbish bin with the rain water (all by gravity!) and now I can just dip my water can in there to water the garden easily! Our rain water system. And our last generation powerless lawnmower! I am working sometimes on a charter boat, to do catering. I am enjoying the views of the harbour when I can. Work on the charter boat! As my work is not far from home, my bike is my mean of transport! I got one bike pretty soon after we moved in, but I was still looking for the perfect city bike… when I found it, I was really happy! After I changed the rim tape, tubes and tyres, it was all good to go! Now I still need to change the dynamo (It broke after using it for 5km… too bad!) but it is a great European bike! So I sold my first bike and kept my city one. I used it also to take a part in the opening of a new cycle path in the city with a couple of friends. Amazing how many people actually have a bike in Auckland, even if it is full of hills! My old and new bike, the new cycleway and the mandatory helmet! 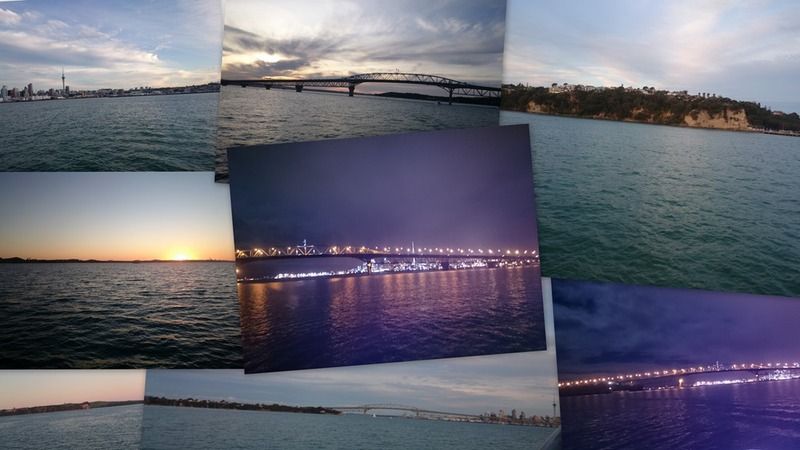 We did a couple of excursions out of the city on some week ends… More about them in an other article! Sorry, my daughter, but I’ll write my answer in french… ce sera plus lisible, et je ne saurais écrire en anglais tous les compliments qui se bousculent en lisant le résumé de ces derniers mois… je voulais justement te demander des nouvelles de la dynamo ! 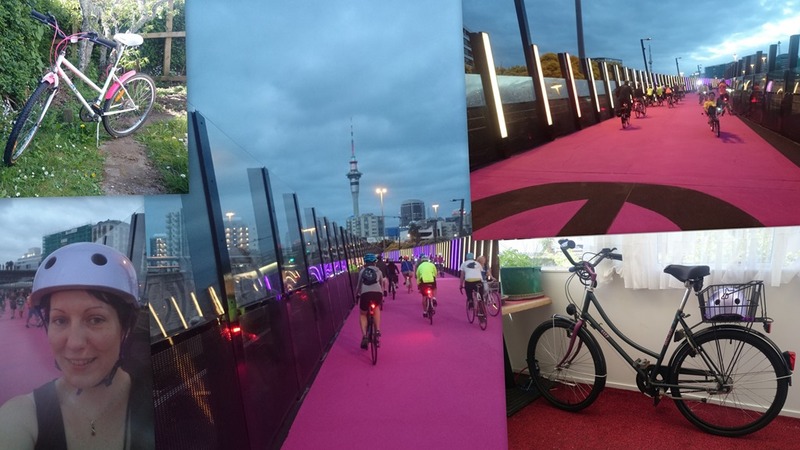 alors on voit la vie en rose, lorsque l’on fait du vélo, à Auckland ? 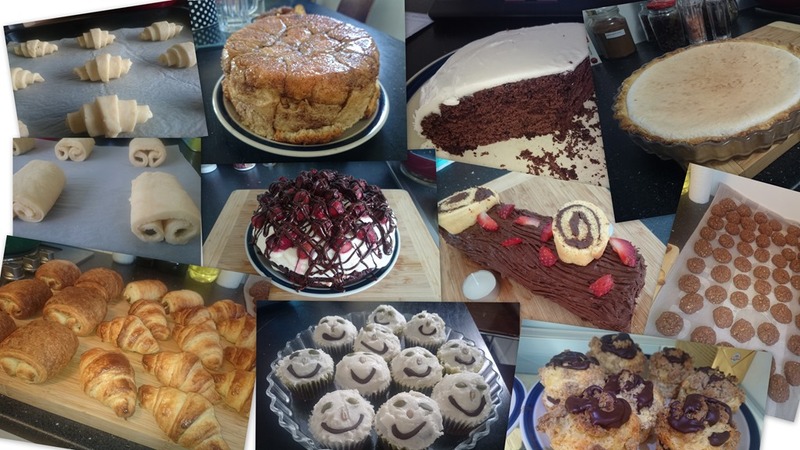 Une questionnette : c’est quoi le monkey bread ? il y a bien ton frère qui fait le singe parfois, tout de même, ce n’est pas du frérot bread ??? Contente aussi de voir votre bébé jardin. Bravo pour la réussite de l’élevage de vers ! Voyons, mon coeur balance entre deux sujets: les lombrics ou l’étalage de bonnes choses…Finalement, je vais peut-être m’attarder aussi sur vos installations “fait-maison”. Que de choses bien accomplies, j’admire votre esprit d’entreprise. Et j’envie ma soeur de prévoir déjà son prochain voyage vers vous. Il va falloir que j’y pense sérieusement, moi aussi: vous me manquez trop, tous.